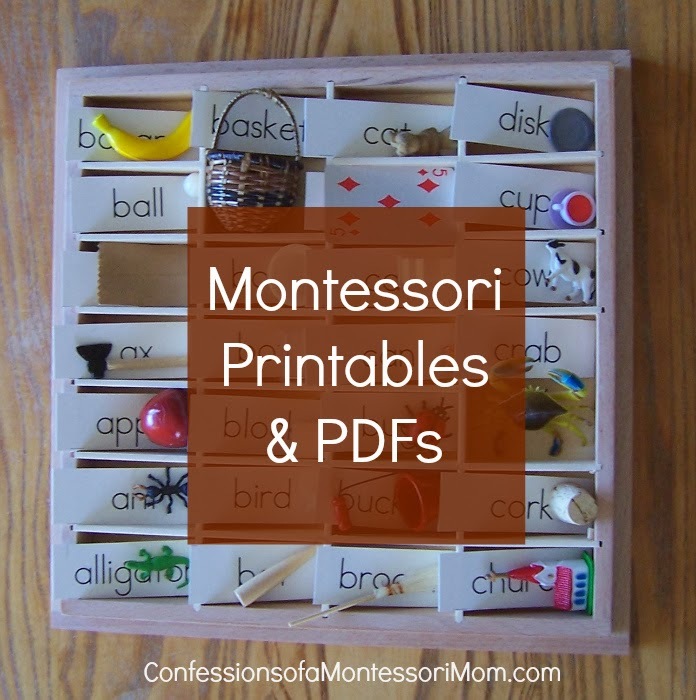 Montessori printables,downloads, and PDFs are an inexpensive to make your own, DIY materials for your homeschool or day care setting! Well I have some terrific resources to share with you from the Montessori mom bloggers of the Montessori Bloggers Network. Want to PIN for later? Montessori teacher Seemi from Trillium Montessori offers Montessori printables including phonics, literacy, and seasons and holiday themes (too many to list) here on Teachers Pay Teachers, which is a fantastic site where you can free and affordable downloads AND support teachers! You will also find Montessori PDFs on Montessori Nature's online store at Teachers Pay Teachers here. She offers English Language Arts, Math, Science, Social Studies, Arts and Music, and more, all for free or under $5. Spanish printables from Cristina of Montessori en Casa including color tablets, counting, geometric shapes, Pink Tower extensions, world continents, opposites, and sequencing. She also has a brand new ebook out in Spanish The Urban Garden in the Montessori Environment. Cherine has a growing list of Montessori and related printables on her blog, Making Montessori Ours including sight words, letter matching, adding board, currency, sequencing! See the all here! Jo of My Organized Chaos offers several Montessori PDFs in her online shop including culture, sensory, language, and flash cards. Deb Chitwood has a list of free Montessori materials online here. on her blog Living Montessori Now. Carolyn also has a TpT store with PDFs including a Montessori freebie like this one. Before you go, please check out my affordable online Montessori programs and PDFs for birth to age nine! Need quality Montessori materials? Shop at our favorite Montessori seller (and our affiliate), Montessori Services!